The Guardia di Finanza (Italian Custom Police) has recently become the only Italian police force to carry out control activities at sea following a recent legislative decree approved by the Italian Government for the rationalization of the tasks of the police forces*. 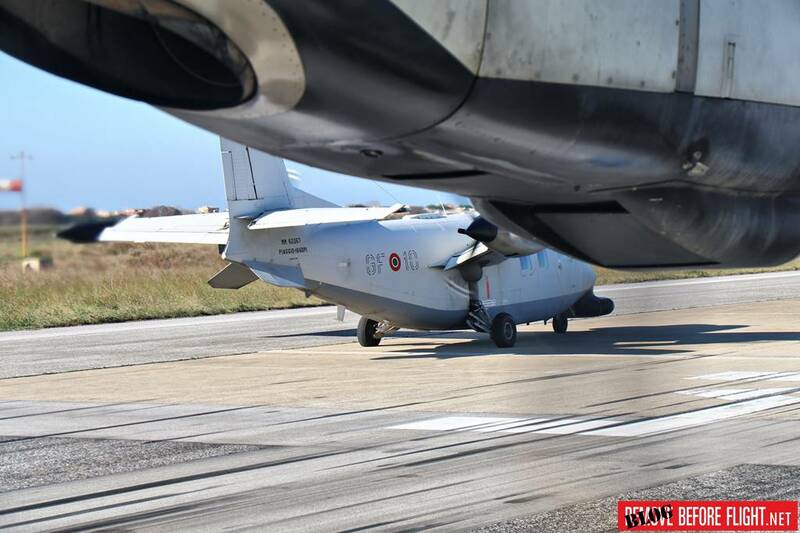 This task has been assigned to the GDF as it is the only Italian police force to be equipped with aircraft and ships suitable for border control and the fight against illicit traffic conducted by sea to the Italian coast. The GDF Unit most involved in these activities is the Gruppo Esplorazione Aeromarittima (GEA). 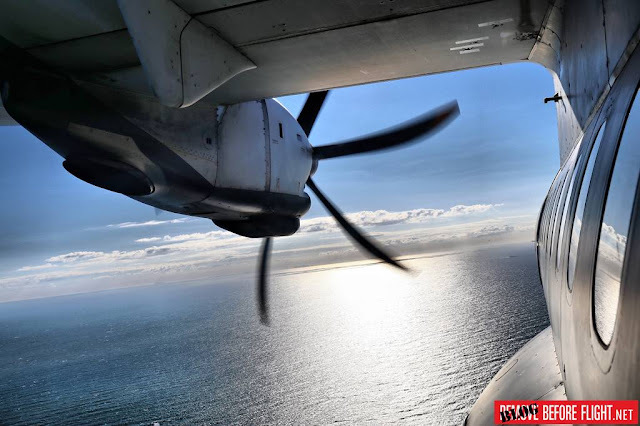 The GEA is based at the Pratica di Mare airport, 30 km far from Rome, and provides for the fight against illegal immigration, drug and arms trafficking, the prevention and repression of smuggling and environmental police activities, thanks to its fleet consisting of an ATR 42-500MP (Multi-Purpose), an ATR 42-500 in the "green" variant (for transport), two ATR 42-400MPs, two P 180 Avanti IIs for VIP transport and 6 Piaggio P166 Mid Life Upgrade DP1 planes for short and medium range patrols. This article mainly tells about the ATR-42 as it is the most advanced aircraft of the GEA and the one we boarded to follow a planned patrolling mission. The ATR-42MP is based on the commercial aircraft produced by the French company ATR (Avions de Transport Regional) in collaboration with the Italian company Leonardo, and represents the most advanced platform currently available to the GDF. It is equipped with the updated ATOS mission system (Airborne Tactical Observation and Surveillance) installed in the rear cabin. The ATOS is a system designed by Selex Galileo, now part of Leonardo, which acquires data through external sensors and converts them into images that are transmitted on the console. The main console is palletised to be quickly removed from the aircraft and consists of two interchangeable stations called MOC 1 and 2 (Multifunction Ope-rating Consolle) where each operator has two multifunction monitors, a joystick and a control panel. Both monitors can provide images transmitted from the FLIR SYSTEM StarSafire 380-HD tower or from the Raytheon SeaVue 2022 Radar. The SeaVue is positioned in the front ventral radome and is able to cover distances up to 256 nautical miles and to detect very fast boats with low radar reflection. The Flir System turret is instead positioned near the right rear wheel of the plane and is an electro-optic group composed of a 360° rotating platform that includes 5 different paylods: a high-resolution color video camera (HDEO), a high-level camera resolution for low light conditions (LLTV), a high resolution infrared camera (HDIR), a small wave infrared camera (SWIR) for the improvement of image resolution and a laser pointer. These sensors allow to obtain extremely stable images even in the presence of high rate of turn of the aircraft and to recognize, identify and locate the surface targets both day and night. The standard crew for the patrol mission consists of two pilots, Commander and Co-pilot, a TACCO (Tactical Operator), two system operators and two search and rescue operators. The TACCO covers the role of coordinator and head of the mission, the two system operators carry out the activities on the MOC 1 and 2 consoles and the two SAR operators as observers through the "bubblewindows" (in case of need they they also take care of the launch of the lifeboats on board the ATR). 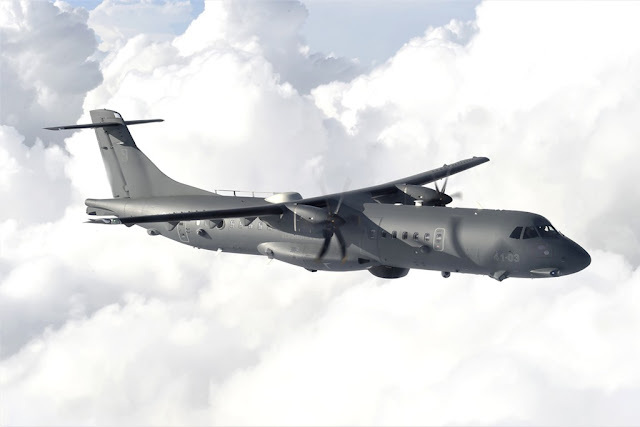 The ATR-42MP can be easily and quickly reconfigured to perform many other types of missions, such as Environmental Control, MedEvac, SAR, Passenger Transport, Freight Transport and Paratroopers. 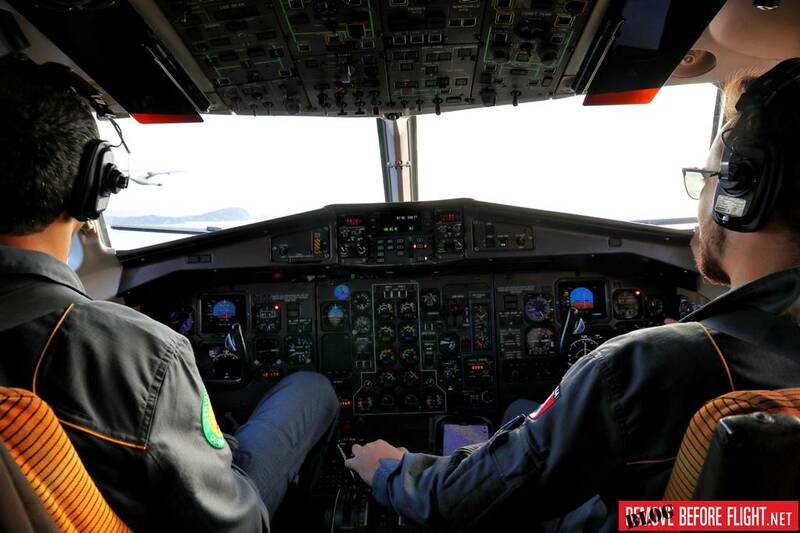 During my visit to the GEA, I had the opportunity to participate in a planned standard mission on board an ATR-42-400 to see how the personnel perform their duties and the peculiarities of the aircraft. The mission included a joint flight with a P-166 aircraft and a patrol at sea. During the activity I could see the effectiveness of the on-board systems and the ability of the staff to be able to discriminate potential threats. The automatic identification system (AIS), consisting of a VHF transceiver, connected to a GPS and to the navigation instruments of the boats, provides the kinematic data, the general information of the boat and generates alarm signals in the event of a possible collision. All the tracks acquired by the radar without AIS are investigated by the system operators and then transcribed in the Mission Report that the crew prepares at the end of each flight. The pilots can view, thanks to a high resolution screen in the cabin, the images processed by the two MOCs and promptly evaluate whether to warn the Naval Operations Command to activate the interdiction system. The mission was short, about 2 hours, but thanks to the great autonomy of the aircraft, it can last up to 8 hours. Recently, the GEA has undergone important changes: starting from 2018, the scheduled maintenance of 1,200 hours is no longer carried out by the aircraft manufacturer but by GEA personnel, guaranteeing significant savings. It is an invasive intervention that involves the removal and control of the main parts of the aircraft, including the fuselage. The first intervention of this type was performed on P166. Another important news concerns the first phase of plane pilot training that no longer takes place at the flight school of the Italian Air Force, but in the United States. Student pilots undergo a first phase of theoretical training at NAS Pensacola, Florida, and then train in flight on board the T-6B Texan II at NAS Whiting Field, Florida, and on the T-44C at NAS Corpus Christi, Texas. The operations carried out by the GEA have contributed to increasing the prestige of the GDF in Italy and abroad. It has made a fundamental contribution to the fight against illegal immigration by deploying men and aircraft in several international operations. The Unit participated in the missions promoted by the European Agency "FRONTEX" in the Mediterranean Sea to coordinate EU border patrol missions and support member states in joint operations for the return of irregular migrants. Today, as part of the operational projects promoted by the European Border and Coast Guard Agency, a new name of FRONTEX, the GDF coordinates the Themis operation for the control and defense of European borders in the Mediterranean. 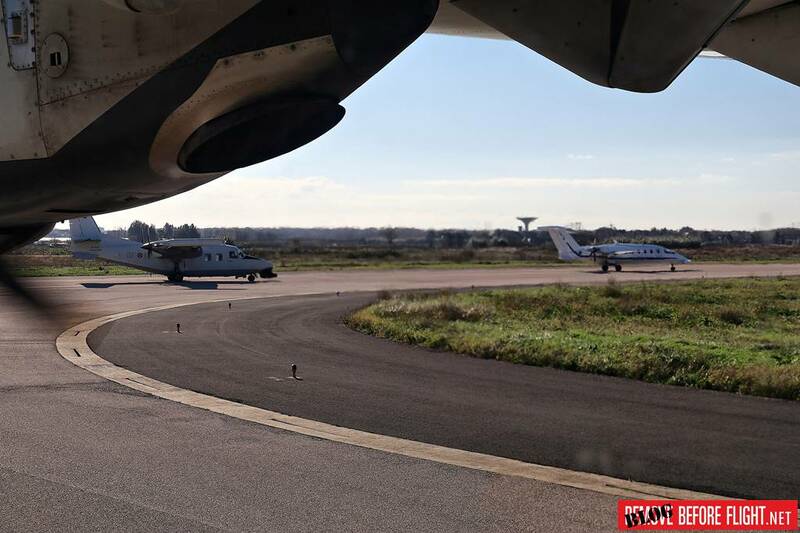 In July 2018, the GDF purchased from Leonardo an advanced ATR-72MP aircraft and related technical-logistical and training support services with an option for 3 other aircraft. The first ATR-72MP will be delivered to GEA at the end of 2019 and progressively all the ATR-42 will be replaced with the new aircraft. 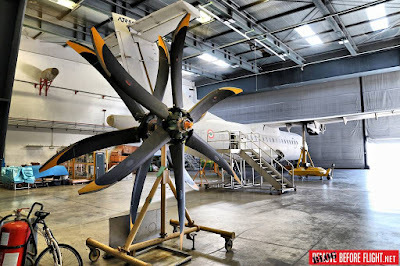 The ATR 72MP, designed and built by Leonardo’s Aircraft Division, was developed from the commercial “best seller” ATR 72-600 to carry out a vast range of missions. It combines the layout, reliability, maintainability and low life-cycle costs of the typical of civilian ATRs with a cutting-edge mission system, manufactured by Leonardo, advanced sensors and a comprehensive communications suite with excellent Command, Control, Communication, Computers, Intelligence, Surveillance and Reconnaissance (C4ISR) capabilities. The basic ATR 72MP missions portfolio includes maritime surveillance tasks (monitoring of sea lanes, fisheries protection, prevention and contrast of activities such as piracy, smuggling, drugs trafficking and illegal immigration), Exclusive Economic Zones patrolling and Search and Rescue. This aircraft can also function as a flying command post for the in-flight management of complex airborne missions involving several air and naval assets. In addition, it can become a platform capable of airdropping rescue boats and parachuting specialized operators thanks to the in-flight operable door. The excellent capabilities of the ATR-72MP will contribute to making the activity of the GEA even more effective. *With the exception of some activities reserved for the Italian Coast Guard.